While the term "scapegoating" taken from the Bible designates an "outcast," it's modern pyscho-socialogical interpretation came to mean a "whipping boy" or the passing of blame onto a "fall guy." 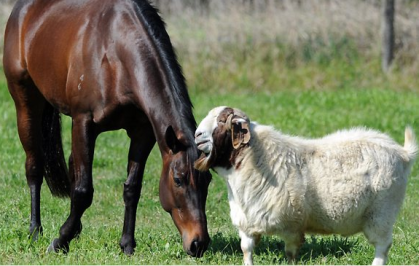 However, in the case of race horses who have a tendency to be temperamental, the alliance with a goat is known to have a calming effect on thoroughbreds. Goats having been companions to racehorses for hundreds of years. Taking a friendly goat away from his horse ally is actually considered the source of the colloquialism "getting your goat," meaning to agitate someone. Its etymology stems back to the practice of stealing goats away from horses in advance of a race, so that the horse performed poorly on the track. In the HBO series, "Luck," Dustin Hoffman who played organized crime boss Ace Bernstein is told that his horse Pint of Pain needs a goat to calm him down before he can become a prize-winner at Santa Anita. In the show's finale and nail-biting photo finish, it proves to have helped. When Pint of Pain wins by a "nose," his goat returns to the stall to acknowledge allegiance to his old pal. 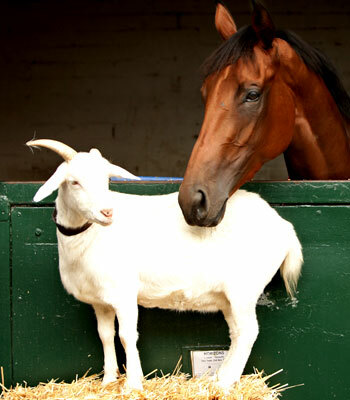 When Australia's best race-horse Black Caviar wasn't tearing up the track, she'd lock horns with her best mate - a goat named Billy. According to a Daily Telegraph report, the superstar sprinter was happiest when she returned home to "kidd" around with her favorite barn-mate. Specialist trainer Peter Clarke, says the two animals shared a bond that was "instrumental in Black Caviar's unbeatable form." The racing odd couple pairing of Horizons, a thoroughbred filly and Betsy, the one-horned pet goat was also a solid match. The two unlikeliest of stablemates could not be separated for any length of time, except when the thoroughbred was required to bring home the bacon by winning a race or two. And if you're still not convinced that horses and goats can maintain a fraternal and symbiotic relationship, check out this video, where "Paulie" the goat assumes the position of a jockey and actually mounts his best friend, who in turn takes him for a spin around the pasture. U.S. Government Finally Ends Research On Chimps, Hooray!